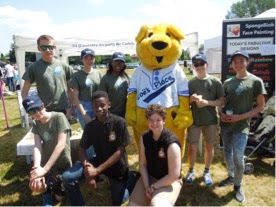 On a very hot Saturday 17 June 2017, 84 (Coventry Airport) Squadron supported Zoe’s Place Hospice in Coventry by taking a stand at their Summer Fayre. Early in the morning a team of cadets and staff set up a recruitment and information stand as well as the Airfield Treasure Hunt game. 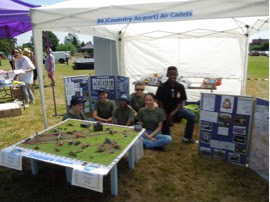 Visitors to the stand were offered information about the Squadron, and the cadets happily chatted about all the activities they do. Everyone who came past the stand was encouraged to spend 50p on entering the Airfield Treasure Hunt game where the lucky ones who chose the right square took away RAF goodie bags. 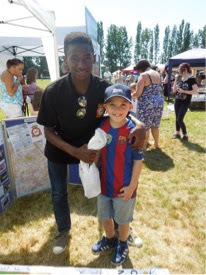 The game raised a total of £26.10. 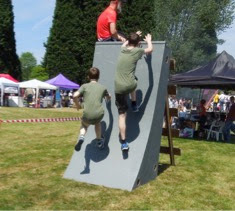 The cadets had the chance to look round the Fayre and several had a go at the assault course despite the heat. They also visited the St Johns Ambulance First Aid station and demonstrated their knowledge of CPR, and got to sit in a fire engine. 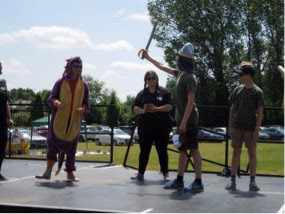 Cadets Phillips and Williams were even roped in to a play about St George and the Dragon! This was a good opportunity to be seen in public again, and thanks go to all those cadets who took their time to help out on the day. 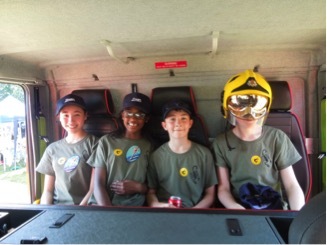 Cadets A Price, Fazaldin, Phillips and Williams in the back of the fire engine. 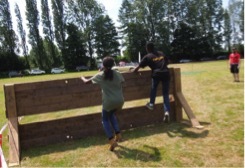 Brother and sister Cadets Jamal and Jamelia Fazaldin got a bit competitive on the assault course, and there was even some foul play between the siblings! Cadets Williams and Phillips on stage!